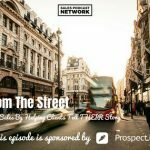 TSE 925: TSE Hustler's League-"Video Revolution"
You’re more than likely listening to this episode because you want to improve as a seller or a marketer. You’re seeking education so you can get an edge on your competition. There’s a tool that many of us are failing to embrace, and it could begin a video revolution. On today’s episode of The Hustler’s League, we’ll talk about how digital cameras can change our companies, and how large organizations are using them well to engage in the video revolution. The truth is that videos don’t have to be expensive anymore, due to the number of free tools out there and the availability of digital cameras. 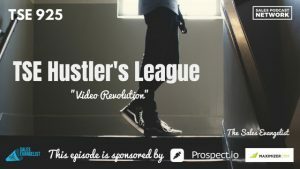 TSE Hustler’s League is an online group training session to help sellers like you and me to learn how we can improve our prospecting. I ran a couple of Facebook ads recently and I had really limited results. Want to know why? I didn’t run the campaign properly, and I used a static image. I didn’t use video. If you scroll through Facebook or Instagram, you’ll notice there are lots more videos than there are pictures there. The reason for that is that we don’t want to invest the work to read something. We’d rather listen because we can consume the content while we do other things. It’s also true that many of us are more visual, so if we can see it and hear it, we grasp it better. In our sales and marketing efforts, we have to look for opportunities to use video. Many of the platforms we use daily prefer video content because it’s working better. 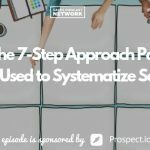 Hubspot, the marketing platform, has started creating customer success platforms and tools. They’re embracing video because it’s more effective. We know people prefer video because it helps them understand things better and it allows them to consume content while they are doing other things. Knowing that is true, imagine using video in your sales outreach. You could send emails to your prospects with videos inside, and companies like BombBomb and Wistia that can help you master video. When you use video, it makes your communication unique, and you’re able to effectively share more information than you can in an email. These two large companies are already embracing video, and it’s only a matter of time before others do as well. If you begin to integrate that into the daily operation of your business, you’ll gain the advantage over your competition. Hubspot is embracing video for both its marketing and its video. They are sending information and creating marketing content that is video-based, and it’s helping their customers. You could use video as an opt-in for your website: a video that explains why you’re asking for the opt-in and what your customers will get if they do it. Use it to teach your customers. If they get new software, they don’t want to read an entire book to understand how to use it. You can literally infuse video throughout your entire organization. Take advantage of its benefits when you’re doing outreach, when you’re marketing, and when you’re teaching your clients. I use video to train my team members about the backside of the podcast: how to upload audio or how to create artwork. Emails and other forms of electronic communication are less personal. They don’t allow our prospects to experience who we are as people. Videos allow your prospects to hear you, to see your mannerisms, to hear your tonality, and to see your gestures. It helps them build a connection to someone they don’t necessarily know yet. Video is the future of sales. If Company A sends me a long outreach email, and Company B sends me a quick video, I’ll be more inclined to click on the video to hear what he has to say. How can you use video in your sales and marketing efforts? Can you use video to help with client success? How can we use video to train people? Share with me what you decide to do with video capabilities. We’re doing a little bit of remodeling with TSE Hustler’s League this upcoming semester, changing up the curriculum. We would love to have you check it out and apply and see if it may be something that can benefit you. If you aren’t sure you have the right CRM, Maximizer CRMis a personalized CRM that gives you the confidence to improve your business and increase profits. Get rid of the boring CRMs and customize to your team’s selling abilities.